The summer VPR Artist Mug depicts the Wabanaki Creation story as told by Carolyn Black. Hunt and Black perform as The Laughing Couple throughout the northeast. 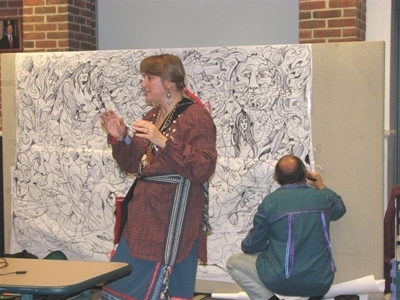 In their stage presentation Carolyn recites the creation story and Rick illustrates it on a large mural. That’s right: Mitch Wertlieb, host of Morning Edition on VPR, delivers this wrap written by a VPR listener. Anything to make the phones ring during a membership drive.